SUSTAINABLE, NATURAL ALTERNATIVE to plastic cling wrap. Wrap up cheese, fruit, vegetables, produce, and bread. Great for wrapping a bowl, or packing a snack for your next adventure. Use as a place mat, or bundle up hiking and backpacking tools, utensils, and toiletries for zero waste camping. Also makes a great earth friendly kitchen gift! WASHABLE, REUSABLE, & COMPOSTABLE. Use the warmth of your hands to soften the wrap and form over a bowl or piece of food. As the wrap cools, it creates a seal and stores food naturally. Wash in cool water with mild soap and air dry. 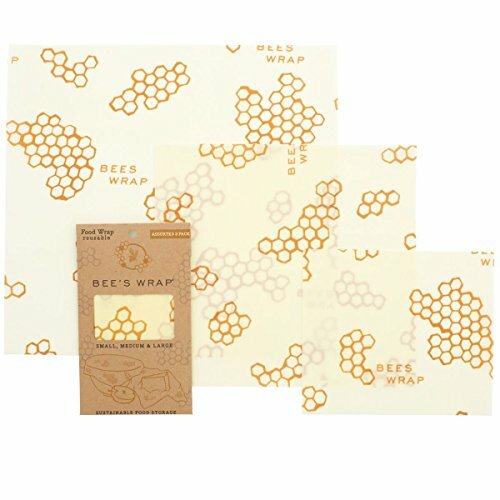 The natural antibacterial properties of beeswax and jojoba oil help keep food fresh and allow Bee's Wrap to be used again and again. ECO FRIENDLY INGREDIENTS. Made of organic cotton, sustainably harvested beeswax, organic jojoba oil, and tree resin. Bee's Wrap fabric and printing are certified by the Global Organic Textile Standard, and our packaging is made from 100% recycled paper and biodegradable cellulose. Once your wrap reaches the end of its useful life, compost or use as a natural fire starter. GREEN-AMERICA CERTIFIED. Bee's Wrap is committed to using our business as a vehicle for social change. We aim to better the lives of our customers, employees, community, and planet. SIMPLE, BEAUTIFUL, PRACTICAL. Assorted 3 Pack includes 1 small (7" x 8"), 1 medium (10" x 11"), and 1 large (13" x 14"). Handcrafted in Vermont, our reusable food wraps last about one year when used several times each week, while traditional plastics are used for a matter of minutes and can linger in our environment for 2,000 years or more and won't biodegrade.